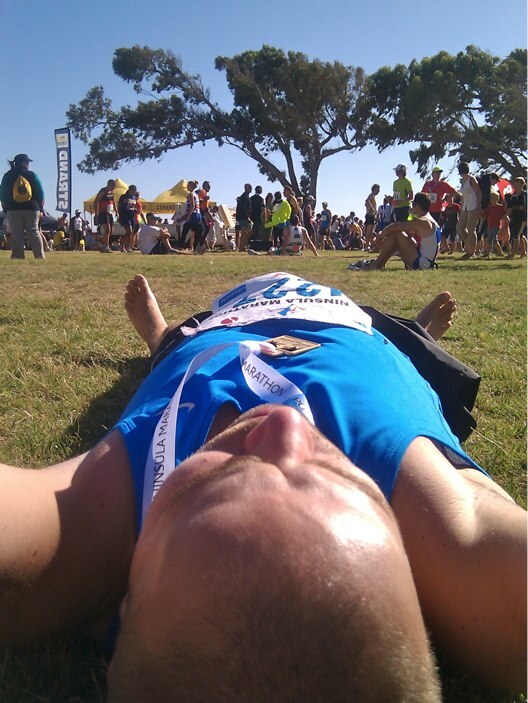 While my original plan was to premiere with my first half-marathon in April 2011 for Two Oceans Marathon 2011 a spontaneous decision made me enter and run the Peninsula Marathon in Cape Town on February 20th. 9 days prior to race I felt fit enough for the 21km race, even though I’ve never done more than 16 km before, and I was bold enough to signed up for start number 4227. My Problems only began thursday before the race sunday, when my new Asics running shoes I had just bought in December were stolen and I decided to go for a last pre-race 13km run in my 5 year old Nikes. Just after the race I realised that my left Calf did hurt and it didn’t got much better until Saturday evening. I knew I couldn’t do the race in my old shoes, so I went to buy new running shoes and got new Asics and some great advice at The Athletes Foot at V&A Waterfront. The very helpful advice I got from Athletes Foot owner Grant Bryant was that I should be using my old inner soles in the brand new running shoes. With this in mind I arrived in Bergvliet on time for the 7am race start – see photo above for my impression, standing at the end of the start block. The start went well and after few minutes everybody was able to run at his or her own pace without accidentally running into others. The ache from tension in my leg didn’t really got worse during the race and I only felt weak towards the 16k mark but had no serious struggle to finish the race. My only serious issue was Runkeeper on my Android phone that crashed after 8 km just to restart with a new session that I can’t merge together. This is the reason why you can only see the last 13 km on this map. The race is seriously beautiful and despite the strong South-Easter wind I fully enjoyed the run past Muizenberg, Kalk Bay, Fish Hoek and Simonstown. Without my Runkeeper tracking my run I couldn’t check for time and was really surprised to end 1:58:20 and was #346 out of the 1265 half-marathon runners when the Peninsula Marathon results were published! The Atmosphere at the finish was really pleasant, as drinks were available, 15-minute massages could be bought for a mere 50 Rand and I met four friends from the The Drinking Club with a Running Problem who just finished the full marathon in 4:29 running together for the whole race! After some glasses of Moreson bubbly we were strong enough to move to a very late breakfast at Boulders Beach restaurant – aaaah – I love these beautiful days in Cape Town!